After the passing away of his master-Sri Ramakrishna-Swami Vivekananda wandered throughout India mostly on foot and without a single penny as an ascetic before he left for West. During this time he came across the pathetic life of the masses in India. He used to talk to rich people, kings of that time to take up different activities for the welfare of the poor. But, except a very few, none gave special interest to actuate the words of the Swami - the unknown & the penniless ascetic among hundreds of other monks, though everybody was spellbound by his all-round personality, wherever he went. With tearful eyes he used to think deeply about the means to uplift the fallen and miserable. This wrung his heart & soul and after a long deep meditation over it he decided to go to West to attend the Religious Parliament at Chicago and preach Indian Spiritual Knowledge & in turn bring Science & Technology to the home. The Swami was well received and the teachings of Hinduism appreciated by the people of West. Returning from the West, the Swami gave a heart-stirring call to his countrymen, especially to young men & women - steady, unselfish, pure & sincere to the backbone, fortified with eternal faith in the Lord and nerved to lion's courage, who would renounce everything and sacrifice their lives for the upliftment of millions of the poor, ignorant & downtrodden, paving the path for their own salvation. That is why to uplift the masses, he envisaged to form an organisation which will work for upliftment of the poor and downtrodden with an attitude of Worship of the Lord in them. He also specially laid down that this organisation should not become a mere temple for ceremonial worship. Hence he founded the 'Ramakrishna Mission Association' in 1897. This body received a legal status and was registered by the name 'Ramakrishna Mission' in 1909. The Swami has declared in unmistakable language that its object is to form character, combining Jnana (reasoning), Bhakti (Love for God), Yoga (Practices of Mind control) and Karma (doing work in a spirit of worship to Lord). During the last days of Sri Ramakrishna a band of young boys, sincere and pure in heart, were living with him and serving him with utmost care. Then they were full of renunciation and tremendous longing in heart for God realization and accordingly they were sincerely practicing Spiritual Disciplines under the guidance of Sri Ramakrishna whom they took as their Spiritual Master. Narendranath, the future Swami Vivekananda, was foremost among them. Sri Ramakrishna commissioned him to organize these young spiritual aspirants whose lives were being molded by him and to start an apostolic succession of monks to continue his spiritual ministry for the benefit of future generations. After the Master's passing, the young disciples under the leadership of Narendranath left their hearth & home and took to the life of renunciation staying in a rented house at Baranagar, Calutta, which turned into a monastery - the first monastery with the ideal of Sri Ramakrishna. Then their whole time was devoted to severe Spiritual Practices, intense austerity, study of scriptures and wandering as ascetics to places of pilgrimage, or solitary mountain caves for spiritual practices. In between the monastery was shifted to Alambazar on the bank of the Ganges. The monastery received its definite shape, both in its form and function, after Narendranath emerged as a world figure - Swami Vivekananda, from the Parliament of Religions, held in Chicago in 1893. In 1901, this monastery got registered as a trust & named as 'Ramakrishna Math'. During this time the Math got shifted to its present site at Belur on the west bank of the Ganges. Thus Ramakrishna Math came into existence. 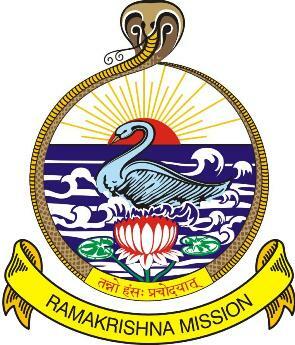 Ramakrishna Math & Ramakrishna Mission are together referred to as the Ramakrishna Order. From the legal point of view the organisation has two distinct wings - the Ramakrishna Math and the Ramakrishna Mission. But this distinction is tenuous, often overlaps and therefore, more theoretical than real. The Math and Mission are closely related. To stress the point - though both the Math and the Mission take up charitable and philanthropic activities, the former lays more emphasis on spiritual development of the people and the latter gives priority to welfare work. 'Atmano Mokshartham, Jagad Hitaya Cha (For the Liberation of the Self and For the Good of the World)'. The wavy waters in the picture are symbolic of Karma Yoga (Yoga, i.e., the communion with God through Action), the lotus of Bhakti Yoga (Yoga through Divine Love), and the rising-sun of Jnana Yoga (Yoga through Reasoning). The encircling serpent is indicative of Raja Yoga (Yoga through Mind Control) and awakened Kundalini Shakti (Coiled-up Energy), while the swan in the picture stands for the Paramatman (the Supreme Soul). Therefore, the idea of the picture is that by the union of Karma Yoga, Jnana Yoga, Bhakti Yoga & Raja Yoga, the vision of Paramatman is obtained. Relief & Rehabilitation Activities at the time of natural calamities like flood, earthquake, draught, famine, etc. Medical Services through indoor hospitals, out patients' dispensaries, mobile health clinics, different medical camps, etc. Educational Activities by running Schools, Colleges, Students' Homes, Teachers' Training Colleges, Polytechnics, Schools of language, Blind Boys' Academies, Orphanages, etc. Work for Women through running specially for women - Maternity sections, Domiciliary, Invalid Women's Home, Girls' Schools, Training Schools for Nurses, etc., to uplift the womenfolk, apart from the common services for men also. The Services for womenfolk is extensively done by Ramakrishna Sarada Math & Mission with the same ideal, which is completely different from Ramakrishna Math & Mission. Work for the Youth through running study circles, youth forums, seminars, youth conventions, etc., wherefrom the youth gets acquainted with the uplifting message of Swami Vivekananda which in turn improves their life, apart from the ones mentioned above. Attention for the Weaker Sections through sending out dedicated workers to rural areas to raise their life status by giving secular knowledge, special training for farming, etc., - in a word, integrated rural development and welfare programmes, apart from the distress relief, medical services & educational activities, etc. Spiritual and Cultural Activities through regular Worship, Prayers, Devotional Singing, Classes, Meetings, Spiritual Gatherings, Public Celebrations, Publication of Books, Magazines, etc., to make the people aware of their moral and spiritual values which if cultivated properly, bring happiness and joy to their life. Ramakrishna MOVEMENT for ALL - by Swami Gahanananda. published by - Sri Ramakrishna Math, Chennai. For Enquirers about Ramakrishna Math & Ramakrishna Mission - by Swami Tapasyananda. Published by - Sri Ramakrishna Math, Chennai. The Ramakrishna Movement - published by Ramakrishna Mission Institute of Culture, Golpark, Calcutta. History of Khetri Center of Ramakrishna Math & Ramakrishna Mission - by Swami Gambhirananda. published by - Advaita Ashrama, Calcutta.